Gjakova might be the most authentic town of Kosovo. At the same time, it is a modern municipality, and the only one with a female mayor. The old town of Gjakova (Serbian: Đakovica) was one of the most developed trade centers during the rule of the Ottoman Empire in Balkans. Although the old town was ruined in the Kosovo war of 1999, the streets are restored to their traditional style. You can walk for a while along the several small wooden shops. If you are lucky, you will find the shop that makes handmade cribs. 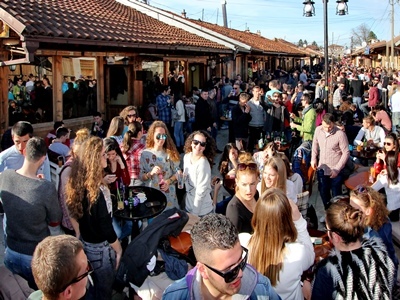 After a renovation in 2014, the central square of the Gjakova old town (Çarshia e Madhe) is a true enrichment of the Kosovar culture. It’s a brilliant spot to have a coffee or a qebab. This narrow street contains only small bars. See picture below. In the summertime at night, the whole street is filled with youngsters. The big Hadum mosque is situated in the Gjakova old town. This is a beautiful building to visit. Nobody around to open the door for you? Then just enjoy the garden and look of the mosque. But the city is more than the Gjakova old town and tradition. Since 2013, it has a couple of big warehouses, kids paradises and bowling. The Nertili Center is worth visiting for a couple of hours. You can drive to it in a couple of minutes, just outside the center. It contains a bowling center, shopping mall, food court, swimming pool and a place to ice skate. Kids have their own place to play. If you want to have a stunning view over the city, you can drive up the hill. This place called Çabrati, has a couple of restaurants with a great view over the Kosovar city of Gjakova. With good weather, you can even sit in their back garden. 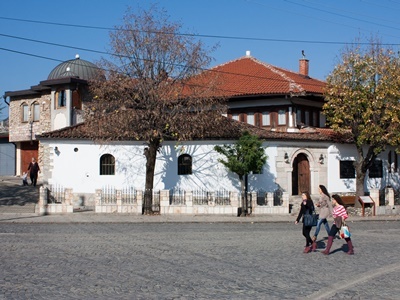 Gjakova has a Tourist Information Office, close to the mosque in the old town. Do you want to know which are the other major cities in the country? Firstly, nice website, well done. It has a good look to it. I am trying to get a of map of Gjakova with the “old” street names. My father used to live in Gjakova, he left in the 1950’s. So he only remembers the “old” names (family tree research). He used to live on Emin Duraku street. I have tried emailing the Gjakova tourist office but the email address didn’t work (where could I get the correct tourist office email address?). Do you have an idea of how to get an “old” map? Dear Goran, thanks for your comment. Check your e-mail, we’ve answered you. I’m also interested to get an “old” map of Gjakova. My father lived there with his parents . They had a house near Ereniku river. I don’t remember the street name. Our good friends lived in a neighboring street called Zenel Hajdini. I’d be very grateful for any help or information about map with old street names. Dear Goga, thank you for your comment! We know that there exist a list of street names of the past and the present. But we don’t have that list. Maybe, when Goran reads this, he knows where to find it. I’m Japanese, I visited Kosovo in October, and I really enjoyed. People are nice, food is good, and lots of beautiful places. Next month I’ll come to Kosovo again, and this time I’d like to visit Gjakova. Is there a direct bus from Tirana? From Prishtina how often there are buses? Dear Yayoi. Good to hear that you enjoy Kosovo a lot. So do we. Not sure about a bus from Tirana to Gjakova, but there are many buses leaving from Pristina to Gjakova. Normally two every hour. As you might know, busses don’t drive a lot after 08PM. then from Prishtina I can go to Gjakova and back in a day. Thank you again for your hospitality! I will visit Kosovo and Albania next summer. After visiting Kosovo, I would like to take a furgon/van from Gjakova to Bajram Curri. I read on an Albanian website that these furgons leave Gjakova from Mula Jusuf square. Is this correct ? I couldn’t find this square on a map of Gjakova. Where is this square located ? Maybe you could send me a map of Gjakova on which it has been pointed out ? And is it correct that these furgons/vans leave every hour between 10 AM and 2 PM ? Dear Eric. Send us an e-mail two weeks up front, and we will do our best for you to find te answer`..